July is peak summer and that means it’s head-to-the-beach time. These six beach towns in Northern Michigan turn an afternoon by the surf into a full-blown experience. This picturesque village on the northern tip of the Leelanau Peninsula has a lovely public beach (just follow Omena Point Road around the arc of Omena Bay) perfect for spending an afternoon with a good read. Take a walk through the village, home to Tamarack Gallery, where you’ll find works by regional artists. Cap off your afternoon with wine at Leelanau Cellars’ tasting room. Regional fare and a waterside table await at Knot Just a Bar. Check out waterfront rentals for your stay (two-bedroom chalet with loft on Mougey Lake, $230/ night, vrbo.com). Nestled on the shores of Pentwater Lake where a channel connects it to Lake Michigan, this sweet hamlet south of Ludington has all the makings of a relaxing, sun-kissed getaway. Stroll along Hancock Street for shopping and dining (Gull Landing offers patio seating with a view of the harbor, plus live music) and take in the sunset at Pentwater Beach and Charles Mears State Park, which stretches to the north for nearly a quarter mile from the channel pier and lighthouse. Book your stay at The Hexagon House, a Victorian bed and breakfast in the shape of, you guessed it, a hexagon, that’s surrounded by three acres of beautifully manicured lawn and gardens. (Starting at $159/night; hexagonhouse.com). Find your sugar sand beach at Veterans Memorial Park, located on the southwest end of River Street and on the east arm of Grand Traverse Bay. The location is especially nice for families, as the turquoise waters are shallow and warm, and kids love playing where the mouth of Elk River empties out on the beach. Other features: a newer playground, basketball courts, tennis courts, picnic tables, grills and towering trees when you’re seeking shade. Get a great cup o’ joe at Java Jones, then browse the shops on River Street. At day’s end, find authentic Cajun Creole at Pearl’s New Orleans Kitchen. For an all-inclusive resort experience, book a stay at White Birch Lodge overlooking Elk Lake (condos, townhouses, and cabins available). Pitch your tent and get beachcombing at Wilderness State Park, where you’ll find 26 miles of Lake Michigan shoreline. More than 10,000 acres are home to numerous trails, rustic cabins and bunkhouses, and more than 250 modern campsites. Your fudge-fix awaits in Mackinaw City, where there is also terrific shopping and dining. Escape the crowds for an afternoon with a leisurely cruise on back roads to Cross Village and Legs Inn restaurant. Enjoy Polish and American cuisine in the outdoor dining area—complete with Lake Michigan views and spectacular summer sunsets. A best beach list wouldn’t be complete without an awesome spot to unearth beautiful stones, including, of course, Petoskey stones. To that end and much more, meet the 300-acre oasis that is Petoskey State Park. 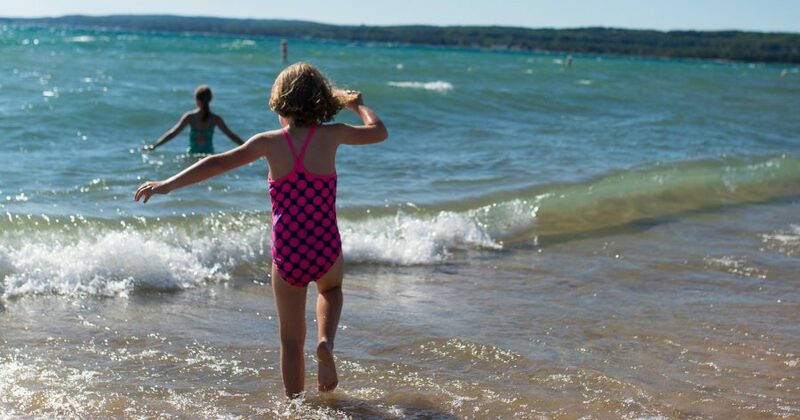 Situated on the protected inner curve of Little Traverse Bay, the park’s shoreline features soft dunes and crystal-clear, shallow waters. While you’re there, follow the half-mile hiking trail to the top of Old Baldy, a nearly 800-foot-tall sand dune that affords a magnificent view over the bay. Stay at the park—there are two separate modern campgrounds—or book a stay near downtown Petoskey for easy walking to the city’s historic Gaslight District with its fabulous boutiques, galleries, and eateries. Click the cover to read the Petoskey Vacation Guide.